In a small mixing bowl combine cream cheese, snipped chives, milk, dill, garlic, lemon juice, and pepper; set aside. In a large pot bring 3 quarts water and the olive oil to boiling. Add salt and lasagna noodles. Cook noodles for 10-12 minutes or until pasta is nearly tender or al dente. Meanwhile, snap off and discard woody bases of asparagus. If necessary, trim to 5 inch lengths. Add asparagus to pasta, Cook 3 minutes more. Drain. Rinse with cold water. Drain. Pat dry with paper towels. Spread about 2 Tablespoons of the cream cheese mixture evenly over each lasagna noodle. Divide salmon evenly among the noodles, placing a single layer of salmon or locks on each noodle. 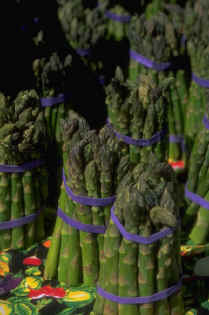 Place 3 asparagus spears on one end of each noodle, letting the tips extend beyond the edge. Roll up each noodle. Tie with a fresh chive. Stand standing rolls upright to serve. Makes 8. Substitute 8 slices toast for noodles. Omit the cream cheese filling. Place one thin slice of salmon or lock on each slice of toast (one per salad plate) then 3 asparagus spears, already cooked. Chill. Make Hollandaise sauce and pour over top. Garnish with slices of hard boiled eggs. Serve. Heat oven to 325 degrees. Toss rice and spinach together. Add eggs, milk, Worcestershire sauce, salt and onion. Pour into 10"X6"X1 ½" baking dish. Sprinkle butter and cheese over rice. Bake 30-40 minutes. Place thawed potatoes in a 9 X 13 inch baking dish. Mix together butter, soup, cheese, sour cream, salt and onion. Mix this through the potatoes. Top with the crushed cornflakes. Drizzle melted butter over all. Bake at 350 degrees uncovered for 45 minutes. 1 pound grated cheddar cheese. Heat butter and cream. Pour over potatoes, placed in a casserole dish. Top with cheese. Bake at 375 degrees for an hour in covered casserole. Pour all ingredients into a crock pot. Turn on "low" and leave for 2 1/2 to 3 hours. During the last 30 minutes, add the milk. Prepare a large baking dish 9"X13" with cooking spray like Pam. Layer potato slices in bottom of pan, cheddar cheese, bacon bits, white sauce. There is usually enough to make two layers of this. Bake at 350 degrees for about 1 hour or until done. Melt butter in a sauce pan over low heat. Sauté the onion. Stir in flour and cook for a minute. Do not allow to brown. Add salt and pepper. With a wire whisk, slowly add milk or half 'n half. Stir constantly until the mixture is thickened. Combine the rice, salt, butter and 6 cups cold water in a big saucepan, and bring to a boil. Stir, cover, reduce the heat, and simmer for 12 minutes , or until just cooked, al dente. Add the saffron during the last 3 minutes of cooking. Stir in the Parmesan cheese, cool the rice to lukewarm, and then mix the eggs and nutmeg into it. Take a heaping Tablespoon of rice, about the size of a jumbo egg, place it in the palm of your hand. Put 1 or 2 cubes of mozzarella more or less in the center of the rice in hand. Compact the rice ball as you would a snow ball, and then pat it into an oblong shape. Roll it in breadcrumbs, patting gently to get as many crumbs as possible to stick to the outside. Continue scooping, stuffing, rolling until all are made. Let them rest about 10 minutes before frying. Put about ¾ inch of frying oil in the bottom of a heavy skillet. Bring to a high heat, lower the supplì one by one into the hot oil, and brown thoroughly on all sides, turning gently. Drain on paper towels and serve warm. Mix all together and garnish with paprika. Bake at 325 degrees 1 and ½ hours. Mix all together and place in baking dish, baking at 350 degrees for about 45 minutes.